Powers is the first ever series to “air” on the PlayStation Network, and no, I’m not exactly sure what that actually means either, but it’s now producing original scripted content, and that’s what counts. Powers is based on a comic series co-written by comic superstar Brian Michael Bendis and Michael Avon Oeming. Powers supposes a world where some people have, well, Powers. The limits and types of powers are unclear from the pilot, but basically the type of powers that superheroes have – flight, super strength, teleportation, and more in that vein. As one would imagine, in a world with powers, some of the people with powers, or as their simply called in this universe, Powers, act as heroes, saving people, while some of them act as evil-doers, stealing and robbing and committing other nefarious deeds. The protagonist of Powers is Christian Walker, a former Power, who lost his powers (there’s no getting out of using that word many times in this review), and now works as a detective in a Los Angeles Police Department division which focuses on dealing with criminals with powers. Walker was known as Diamond and has and had close relationships with a number of prominent Powers, which gives him added insight into their activities. Other characters include his brand new partner, Deena, a Power named Johnny Royalle who seems like the primary antagonist, and a Power named Wolfe who was once Walker’s mentor, went nuts, somehow took Walker’s powers, and is now locked up deep underground in a very special prison cell. I like comics, and I like superheroes, and while superheroes sometimes ensure a number of practices that lower the ceiling of a show or movie, I’m always at the least interested. The production values are not great, particularly the visual effects, which I rarely complain about but are notably inferior enough to merit mention. It wouldn’t really matter if Powers was a cheap comedy, but for an action-oriented superhero procedural, it looks kind of cheap, and it does have a negative impact on the overall effect. The acting isn’t wonderful either. Everything about the pilot feels a little bit clichéd, and a little bit stylized in a bad way. The dialogue doesn’t help the acting and the acting doesn’t help the dialogue. The characters in their current form need work to become more than easy types, and while that’s true of any pilot, there’s not the little hints of depth that a good pilot shows off. These deficits are actually in opposition to the concept, which while being incredibly similar to so many other concepts still feels slightly different enough, where if you saw it in the best light possible, there’s a lot of potential. The lack of name-brand superheroes means there is more room to maneuver and more shades of gray and mystery for the characters to enjoy. The concept is most similar to Heroes but it feels slightly darker and less infused with the fate-obsessiveness that, along with several other factors, helped bring the promise of Heroes to a quick close. Powers exists in a powers are endemic, rather than fresh or new, and are envied and resented in equal measure. The nature of people who want so badly to have powers they would jump off a building to try to activate them doesn’t come up nearly as much in the Heroes-verse. If the other aspects of the show could live up to this concept, and if the concept could continue to move in the darker more interesting directions, that subvert and separate from more traditional Marvel and DC superhero products, there could be something here. There’s not quite enough to think that from the pilot though. Will I watch it again? I’m not going to right now. 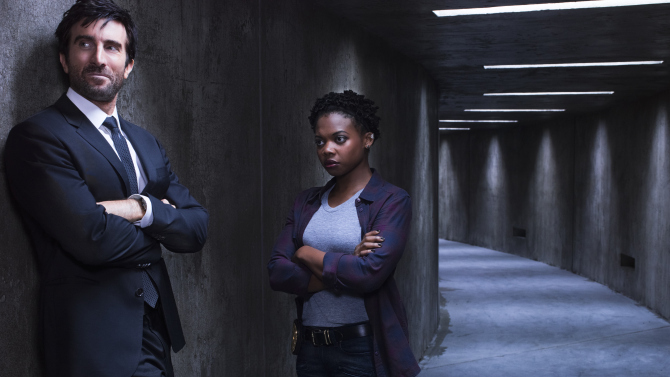 Powers is yet another entry into the tier of shows that could really go either way, and since, with as much TV as I watch, there’s some limit on the amount of shows I can continue to follow, sometimes I have to make arbitrary judgments.